The Mount Hermon ski center - located just a few kilometers from the site of the Hezbollah attack on Har Dov - is open for business. A day after two IDF soldiers were killed in a Hezbollah attack on an army patrol along the Lebanese border, life was seemingly back to normal in northern Israel. 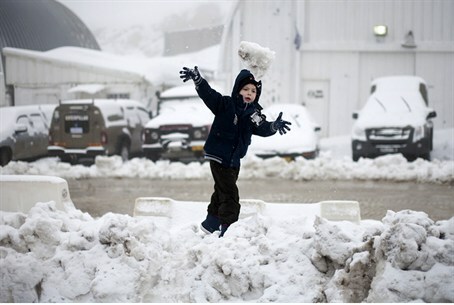 Although there is a marked rise in the number of soldiers and army vehicles in the area, schools and businesses are open as usual, and the Mount Hermon ski center - located just a few kilometers from the site of the Hezbollah attack on Har Dov - is open for business. However, site operators said that there were not many visitors to the ski center - a rare phenomenon, as the center is usually jam-packed with Israelis who want to enjoy the slopes on the relatively few days each year that conditions allow for skiing. More than three quarters of those who had reserved rooms canceled in the roughly 24 hours since the attack. Security officials were hopeful, if skeptical, that the area would remain calm. Hezbollah delivered a message through UNIFIL on Wednesday that it was not seeking to increase tensions with Israel at this time. Meanwhile, the IDF said Thursday that it had resumed examinations of areas of northern Israel where people complained of hearing underground noises - some of which were very loud, and sounded like the sound of heavy drilling. The IDF, said Shimon Gueta, head of the Upper Galilee Regional Council, is taking these reports seriously and is actively examining the complaints.